We design residential solar systems specifically to meet your energy needs, and offer financing solutions for households that prefer to spread out the installation cost over time. Adding a solar power system to your commercial building puts the business of energy production into your hands. Now you can share the benefits of cheaper renewable energy with your tenants while adding a new source of revenue to your ledger. Day One Solar works with schools, churches and other non-profits in our community to find unique solutions that can make clean renewable energy a reality for organizations that may otherwise not benefit from available subsidies. Farmers rely on dependable sources of water to irrigate their crops, and inconsistent weather patterns can lead to more dependence on irrigation pumps. Solar generated power can be your most effective offset to this significant operating cost, giving you a more predictable bottom line and a hedge against future hikes in the cost of energy from the grid. With a well thought-out plan and an approved permit, our installation team arrive at your address on the scheduled time and day, ready to go to work. After layout; the system is assembled and tested, then inspected before we submit your NEM paperwork to PG&E on your behalf. After just a few days, your solar electric generating system is online and powering your home or business. It is really quite simple! Energy storage systems allow grid-tied commercial solar customers to lower peak demand charges and lower energy costs. Solar by itself can cut monthly energy charges dramatically. Storage can amplify those savings by addressing demand charges. Combining solar and storage creates more ways to save and can be a winning combination for customers with the right energy profile. Day One Solar, in partnership with Mynt Systems, performed a comprehensive energy efficiency analysis for the Holy Cross Church and Elementary School complex. As a result, incandescent bulbs and metal halide flood lights were retrofitted with LED lamps and fixtures, and a 55 kW solar PV system was installed on the gym roof for a high-efficiency energy upgrade. $34,000 a year with solar. Like most agricultural business, Koppes Plants was trying to balance the growing demand for their produce with the escalating cost of energy. When they came to the decision to go solar in 2016, they contacted us. Like most agricultural businesses, Koppes Plants was trying to balance the growing demand for their produce with the escalating cost of energy. When they came to the decision to go solar in 2016, they contacted us. 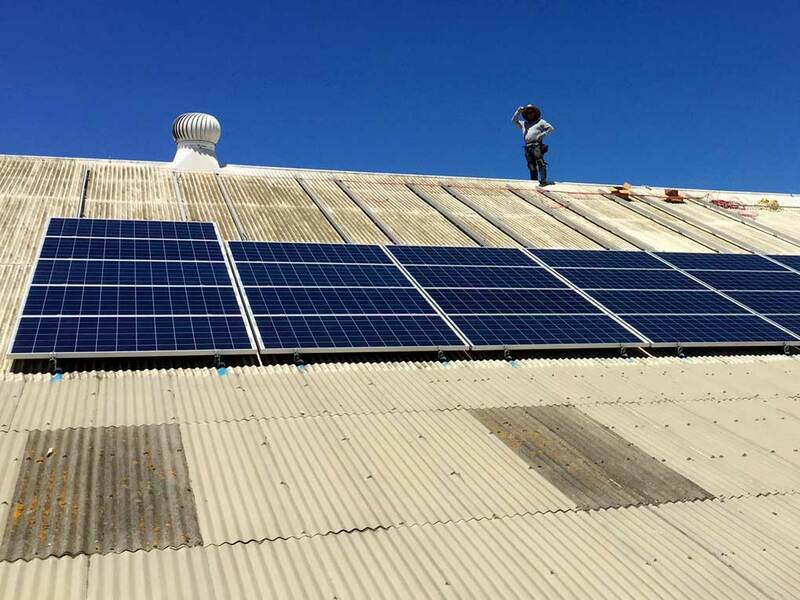 Now, their 82 kW system is just 3 years away from paying for itself through the money they’ve saved since the system was completed. $14,000 a year with solar. 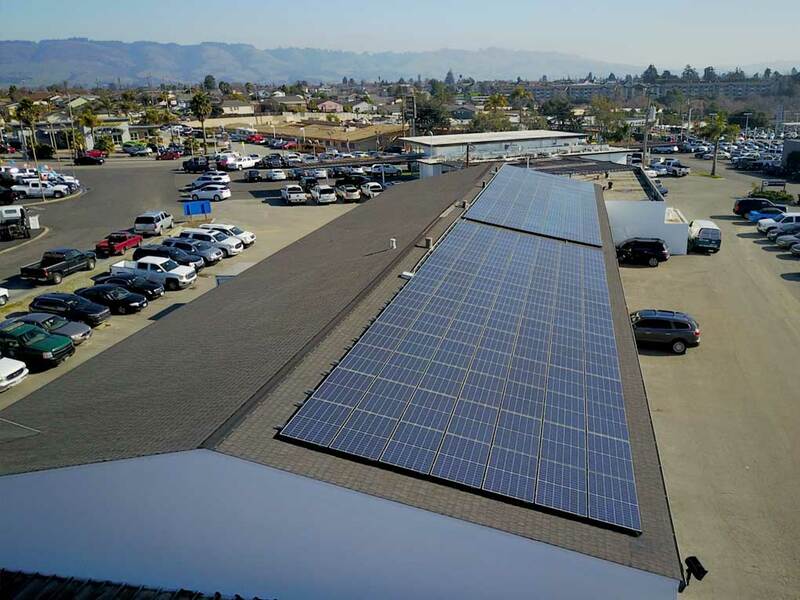 Faced with the growing cost of energy in a highly competitive industry, Watsonville GMC made the smart decision to look into solar energy and called Day One. Faced with the growing cost of energy in a highly competitive industry, Watsonville GMC made the smart decision to look into solar energy and called Day One. 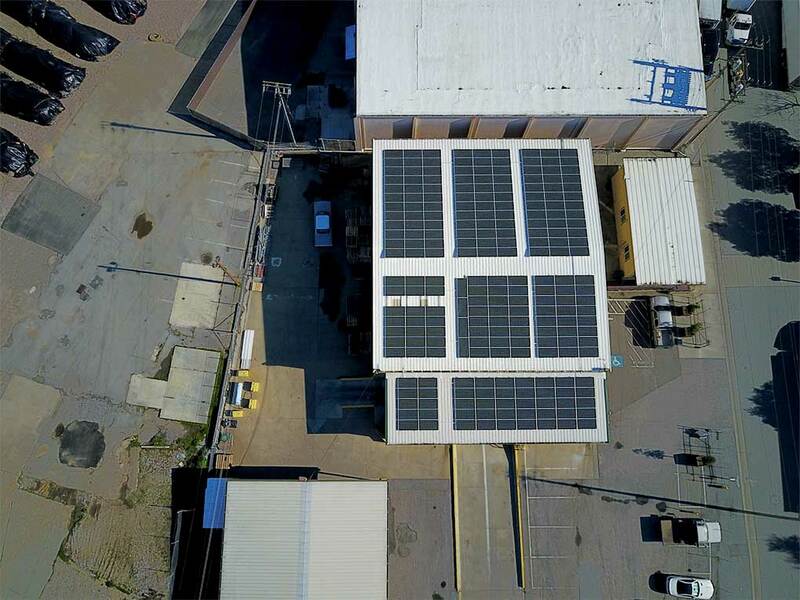 After installing a 50 kW roof mounted solar system, Day One also replaced several inefficient light fixtures around the property with high efficiency LED lights, improving efficiency while lowering the cost of energy for years to come. Rinaldi Tile and Marble is saving $24,000 a year with solar. As an established leader in the ancient craft of stone slab fabrication, Rinaldi Tile and Marble uses state of the art equipment to cut and polish a variety of materials for their clientele. As an established leader in the ancient craft of stone slab fabrication, Rinaldi Tile and Marble uses state of the art equipment to cut and polish a variety of materials for their clientele. But the cost of powering this equipment was taking a big bite out of their operating budget. Now that their new Day One Solar system has been generating their power from their warehouse roof, profits are up and the stress of monthly electric bills is history. THANK YOU TO OUR SPONSERS! This project would not be possible without your help! Absolutely fantastic experience with Day One Solar! I went out to bid with three local solar companies and Day One Solar was the winner. They analyzed our PG&E usage, explained different solar options and listened to what we wanted. They came back with a detailed proposal including a concept drawing of the roof with solar modules. Throughout the whole process they were easy to get along with, knowledgeable, and non-pushy. The install crew wasn't farmed out, they took their time to do things right, like running conduit through the attic instead of the lazy way of running it over the roof. Very impressive. Please tell your family and friends about Day One Solar. You'll be happy like me! Great experience with the Day One Solar team! Install was fast and they were very helpful during the entire "getting onto the grid" process!! I highly recommend Day One Solar based on my experience from start to finish. Their entire staff is courteous and professional, including their front office staff and field service technicians. I plan to use Day One Solar in future to upgrade my system and add a backup power storage system. We got quotes from FOUR solar companies and decided to go with Day One. They were so easy to work with and very communicative. They have a very professional installation team, and the whole process from signing the contract to getting PG&E to start our net metering agreement was faster than anyone estimated: less than a month despite the installation happening during the Christmas holiday. We are very happy with our decision to go with Day One and wouldn't hesitate to recommend them." Tony and his staff are professional, personable and a joy to work with. The solar installation they did at the corporate office and warehouse where I work is absolutely gorgeous and energy efficient. Going solar was such a wise decision made by my employers and choosing Day One as their team to do so was a perfect fit. Thanks again, we love the work your team did and we love being energy efficient!" At Day One Solar, our employee’s safety is our number one priority. While we always encourage efficiency, we place the emphasis on quality and customer satisfaction for each and every installation. Day One Solar is a certified Monterey Bay Green Business and a member of the California Green Business Network. We practice sustainability in our office and in the field. If you are an experienced solar installer looking for employment at a company that values teamwork, diversity and respect, or are simply interested in learning more about the Day One Solar team; send your resume to ops@day1solar.com, attention Matt Thompson. Day One Solar CEO Tony Armor started the Jon M. Rumble Memorial Scholarship in 2016 in memory of his late cousin, U.S. Marine LCPL Jon Rumble, who was killed in action while on patrol in Quang Nam on December 26th, 1968. Jon was a bright and talented young man who enlisted in the Marine Corps to join his older brother in service of his country. This scholarship exists to provide financial support to Veteran students at Cabrillo College who choose to enroll in CEM (Construction Energy Management) courses, in the hope that some may pursue a career in the renewable energy field. Tony Armor founded Day One Solar in Santa Cruz in 2013, beginning with a small office downtown and two employees. Tony’s extensive background as a General Building Contractor has always been valuable asset at Day One, providing experienced leadership for our operations management team. Tony lives on the west side of Santa Cruz with his wife Kate, where he enjoys organic gardening and beekeeping. Ben Valentine was Day One’s first hire back in 2013, and has played a significant role in our growth as a company. Ben leads our system engineering team, providing in-house design services along with supporting our sales team with changes in technology and materials pricing. Ben lives in Santa Cruz where he enjoys mountain biking and surfing. Ben also teaches the Solar Photovoltaics class at Cabrillo College. Matt Thompson joined Day One as Project Manager in early 2016, bringing with him over 16 years of experience in the solar energy field. In addition to managing all of our current projects, Matt also supports residential sales through customer outreach and proposal development. Matt lives in Santa Cruz with his wife and son, and enjoys surfing and mountain biking whenever possible. Rebekah Crill joined Day One in 2017 as a bookkeeper, and has since grown into the dual role of Finance manager and Human Resources manager. Rebekah does the important work of keeping Day One Solar running efficiently while making sure our valued employees are receiving their paychecks and benefits on schedule. Nathon Daellenbach has been with Day One since 2015, starting as an installer and growing quickly into one of our most dedicated employees. Nathon now heads our Energy Efficiency division, leading his team on LED lighting retrofit projects throughout Santa Cruz and neighboring counties. Nathon lives in Watsonville with his wife and two children, where he enjoys organic farming and being a dad. Simply send us the information requested below to schedule a complementary solar assessment for your home or business. The assessment will include the system size (# of panels and Kilowatt rating), identification of the best roof surface for solar production, identification of potential shading problems, and installation price. How Did You Hear About Day One Solar?